Taking pictures of distant stars is no longer just the work of astronomers. Anyone can capture the majesty of the galaxy with a simple camera. You don't need expensive gadgets - all you need is a dark, clear night and the willingness to have a go. Here's how to try your hand at astrophotography. First, find a digital camera. Any compact or DSLR you have tucked away at home will work. Set the camera to a manual mode, and make sure autofocus is turned off. This will allow you to control exactly what the camera does. The key settings you need to think about are the aperture, the exposure time, and the ISO, or sensitivity of the image sensor. Have a wide aperture to let in the maximum amount of light - although a balance must be struck because images with maximum aperture can look blurry. An exposure longer than about 25 seconds will start to show star trails and capture their movement as they travel across the night sky, so experiment with timings. Generally, the rule of thumb is to increase the ISO. A higher ISO number means more sensitivity, allowing you to snap darker objects, but you may have a grainier photo. Playing with these three settings is the best way to get the shot you are looking for. 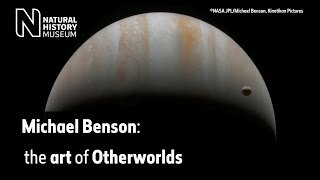 Michael Benson, creator of the exhibition Otherworlds, said: 'A few years ago I did a book titled Far Out. Unlike my work with planetary images, which is based on data acquired by interplanetary spacecraft, this book presented deep space photography - images of our galaxy and beyond. A good tip is to take pictures early in the morning, just before dawn, because light pollution levels are low. Find the darkest patch of night sky you can. Travelling out into the countryside is best, away from the bright lights of big cities. Buying a tripod isn't essential, but they will keep the camera steady if you are taking a picture with a very long exposure. Avoid nights with a bright moon in the sky if you just want to capture the stars. Starlight won't be able to compete. Choosing an interesting foreground can enhance your images of space. Trees or buildings silhouetted against a backdrop of swirling stars look stunning, and having some light sources on the ground can complement the pinpricks of stars in the sky. 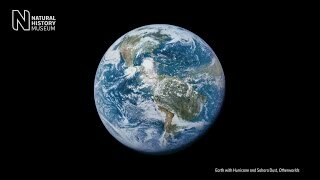 Using a wide-angle or fisheye lens will mean you can get more into your picture. Benson said: 'In recent years a kind of friendly international competition between astrophotographers who specialise in combining extraordinary terrestrial foregrounds with celestial backdrops has arisen. Photo editing software can help you get the best from your efforts in the field. Boosting the exposure can change the feel of an image, and adding tints and changing tones and hues will also overlay new colours onto the bright white pinpricks of stars. Experimenting and having fun is the best way to come up with something that captures the magic of the sky overhead. Using a high ISO setting can sometimes create 'noise' in a photograph, or extra coloured pixels. Many editing suites will let you mitigate this with a noise-reduction feature. Free editing software to get you started includes Fotor and PhotoScape. Share your astrophotography with us on Twitter @NHM_London using the #Otherworlds tag.